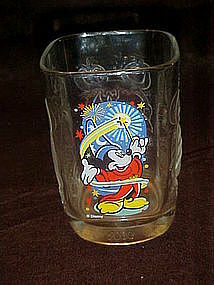 Square clear glass featuring Mickey Mouse dressed as a wizard. The other three sides have various Disneyland and Disney World scenes in relief. Perfect condition. I have 2 available in this pattern. Price is for each. I have others listed from this McDonalds series in my catalog.